If you live in a snow-belt region like the GTA, excess roof snow removal is one way to prevent major roof damage and repairs. While your roof is meant to be sturdy and a dependable protective cover for your home, winter is hardly the time to test it. Here are 5 important steps you can take to avoid leaks and structural damage. Keep it clean: Remove dead leaves, branches, insects, garbage and any debris that may have collected on your roof. Clogged gutters (or eavestroughs) are among the major reasons for leaks. Inspect your roof for damage: Preferably before the winter season or at least before a snow storm. Make sure you are looking for missing or damaged shingles, flashing and open joints. Also check whether the roof drainage system, i.e. the gutters and downspouts, are clean and in working condition. Timely roof repairs can help prevent major damage and early replacement costs. Upgrade attic insulation: A large number of roof leaks and ice dams are caused by heat escaping from the attic and melting the snow. Proper insulation can prevent this heat transfer that aids ice damming as well as reduce your energy bills. Check for ice dams: These are caused by melted snow which refreezes as the temperatures dip during the night, extreme cold or heat transfer from your attic. Ice damming prevents snow and water from draining leading to the formation of bigger blocks of ice. 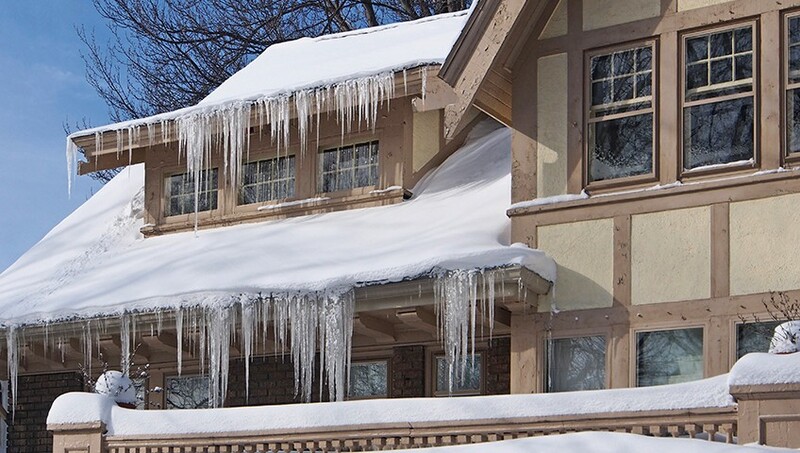 The bigger the ice dams, the greater the risks of roof collapse. Damage aside, these issues also shorten roof life due to greater wear and tear. 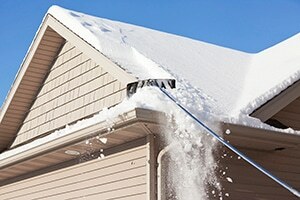 Use a roof rake to clear the snow: It is a handy tool that can help you prevent roof leaks and ice dams. However, take care not to let it snag on the gutters. Ice Damming can cause serious damage to your building and possessions. When your roof’s structural integrity is compromised, it affects the safety of your home and its occupants. At Integrity Roofers, we offer a ice damming services that provides preventative care and skilled repairs to protect and preserve your roofing system. You can rely on our expert roofers to accurately diagnose problems and prevent them from recurring. Take advantage of our expertise to schedule regular assessments and skilled roof repairs that will reduce expensive damage. If required, we can also provide you with professional snow removal services to avoid leaks and future structural problems. Enroll in our roof maintenance program or hire our snow removal services to protect your home from winter weather and costly repairs. Call Integrity Roofers today at 416-736-7373.